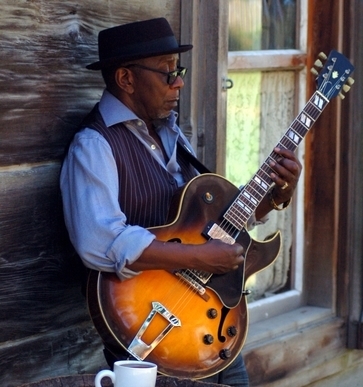 Blues has kept the same overall form since its growth in popularity during the early-mid 20th century. But its broad influence on jazz and modern rock music cannot be overstated. Every musician should have a good knowledge of the blues. This lesson will introduce you to the blues chord progressions that define the genre, and some common (and less common) variations. Plus, it'll get you thinking about timing - something that throws a lot of musicians. There are three main forms in blues - 12 bar blues (which is what most people are familiar with), 8 bar blues and 16 bar blues (less common). There are also variations such as minor key blues and the more elaborate jazz blues which we'll touch on later. Blues is a flexible style, beyond its simple roots, so it's up to you how you use and modify what we're about to learn! 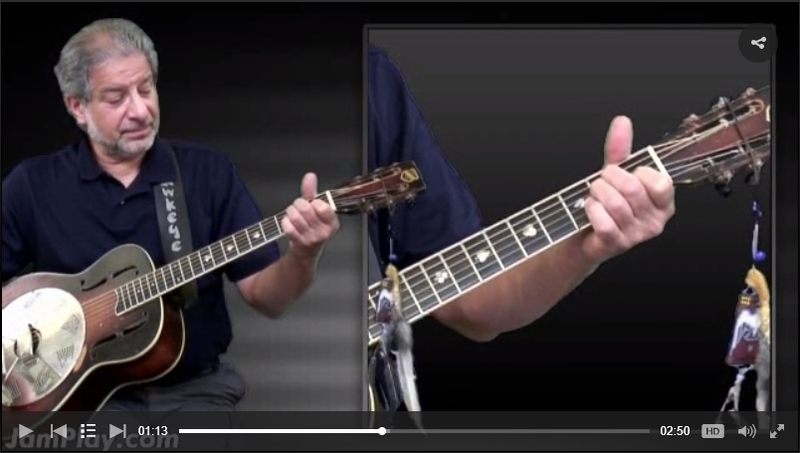 Most major and minor key blues follows a simple formula involving just three chords. We can number these chords 1, 4 and 5. These numbers represent a relationship of chords that reside in a given key. The 1 chord, also known as the tonic, is typically the first chord in a progression and tells us the key we're playing in. The 1 chord can be thought of as "home" in our progression journey. When you hear musicians say "take it home! ", they're talking about resolving to the 1 chord. For example, in the key of G major, G major would be our 1 chord. In the key of G minor, G minor would be our 1 chord. Simple enough! In blues, the 1 chord is always the same as the key name. Another chord used in blues progressions is known as the 4 chord, also called the subdominant. In our key of G major, that would be C major. In G minor, the 4 chord would be C minor. The final chord in typical blues progressions is the 5 chord, also called the dominant. In G major, that would be D major. In G minor, the 5 chord would be D minor OR major (more on this variation later). 1 4 5 is essentially the backbone of blues. A fixed formation of three chords. First, you should learn to visualise this 1 4 5 relationship in whatever key you might be playing. Conveniently, the visual relationship stays the same for any key, a bit like a scale pattern. We just position it at the appropriate fret for the key we're playing in. Tip: The 5 chord root is always one whole step, or two frets up, from the 4 chord root! Remember, that root note formation is movable depending on the key in which you're playing. So if you were playing in the key of A major, simply position the 1 chord root on the note A (e.g. 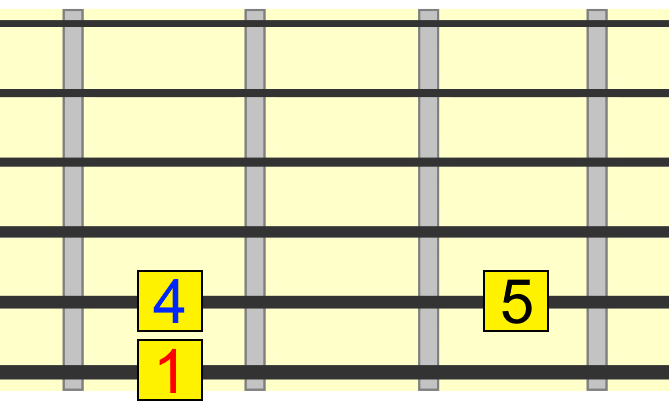 6th string, 5th fret) and position the 4 and 5 chords based on the formation above. Always start with the 1 chord and, no matter what that 1 chord is, the 4 and 5 roots will fall into place based on the above relationships. Of course, you can also use open chords if they fit within the key (e.g. A, D and E would!). But the above, 1 4 5 visual relationship is a quick way to determine which chords should be used in any chosen key. Most blues you'll hear is in a major key. That means the first chord (the tonic or 1) in the progression is either a major chord or a dominant 7th chord (which is a major chord with an additional tone). Sometimes, the 4 chord is played as a minor 4 chord. A typical example of this in the key of E would be: E, A, Am, E, B7, E. You could see this is mixing major and minor key blues. Experiment with using this variation in the different forms later in this lesson. 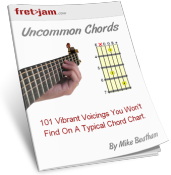 Many guitarists just use open chords or barre chords in their blues progressions. Remember also, for heavier blues styles, power chords are often used in place of full blown 7th chords. Minor key blues uses exactly the same 1 4 5 root relationship from earlier, but with minor chords instead of major/dominant 7th. Simply change the chord type of each chord to minor! For example, an A minor blues progression would typically be: Am7, Dm7, Em7 (1,4,5). However, sometimes a dominant 7th 5 chord is used to create more tension before the return "home" to the minor tonic. For example: Am7, Dm7, E7. In other words, we only change the 1 and 4 chords to minor. The 5 chord stays the same as it would in its major key. 12 bar blues is the most commonly used blues form. 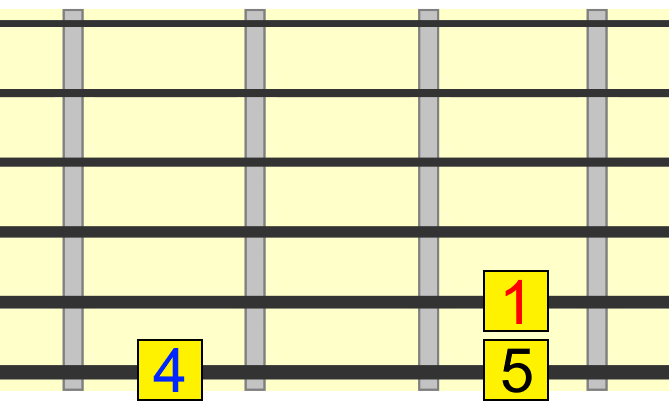 Bars (also called measures) in blues can best be described as consisting of a count of four. And below is an example of the full 12 bars in action. In the below clip, you'll hear two 12 bar runs of a typical blues progression (key of E), with a typical ending. Try to keep the count in your mind as it goes - 1 2 3 4 etc. Now, there are several variations on when the chord changes occur during the 12 bars. However, the overall length remains the same. So as you can see (and hear), the variations are quite subtle. But there are consistencies such as the 1 chord on the first, third and fourth bars, and the 4 chord on the fifth and sixth bars. The 5 chord only comes in during the last four bars. The last two bars typically contain what is often referred to as the "turnaround". This is the climax of the 12 bar blues sequence that prepares the listener for the return to the tonic (the return home) and a new 12 bars. There are a number of embellishments you can apply during these last two bars to enhance the turnaround function, but we'll cover those in a separate lesson on blues technique. If you listen to blues, you'll already be familiar with some turnaround variations. Less common than 12 bar blues, the 8 bar blues form condenses the 1 4 5 sequence into... 8 bars! Notice how that last variation starts on the 4 chord. This is commonly used as a bridge or interlude in a standard blues progression. In short, you don't always have to start on the tonic chord! An even less commonly used form, but still good to know about! 16 bar blues can be seen as an extension of the standard 12 bar form (four additional bars). Jazz often uses the staple blues chord progressions from above as the foundation and embellishes them by adding other chords from the diatonic scale, such as the 2 and 6 chords. Plus, it often adds diminished chords, for example a half step up from the 4 chord position (e.g. Eb7 to Edim7). You can learn all about these other chord degrees back in the main section. Note that BbM7 with a capital M is an abbreviation for "Bbmaj7" or "B flat major 7th". I'll cover jazz variation more in its own section, but the above examples should give you a solid grounding in jazz blues form, which you can build on in your own way. Try transposing these progressions to different keys to challenge your knowledge! Time for a cold one I think. If you've got this far, then you've hopefully learned something new about the flexibility of the blues form. But underpinning it all are those three simple chords: 1, 4, 5. Master this relationship, and you'll be able to back up virtually any blues jam in any key.